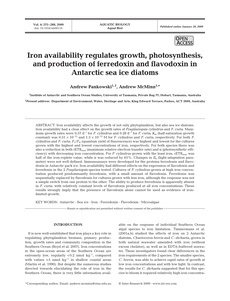 Iron availability affects the growth of not only phytoplankton, but also sea ice diatoms. Iron availability had a clear effect on the growth rates of Fragilariopsis cylindrus and F. curta. Maximum growth rates were 0.57 d每1 for F. cylindrus and 0.28 d每1 for F. curta; Km (half-saturation growth constant) was 0.51 ℅ 10每12 and 1.3 ℅ 10每12 M for F. cylindrus and F. curta, respectively. For both F. cylindrus and F. curta, Fv/Fm (quantum yield of fluorescence) was highest and lowest for the cultures grown with the highest and lowest concentrations of iron, respectively. For both species there was also a reduction in both rETRmax (maximum relative electron transfer rate) and 汐 (photosynthetic efficiency) with decreasing iron concentration. For F. cylindrus grown with the least iron, rETRmax was half of the iron-replete value, while 汐 was reduced by 65%. Changes in Ek (light-adaptation parameter) were not well defined. Immunoassays were developed for the proteins ferredoxin and flavodoxin in Antarctic pack ice. Iron availability had different effects on the expression of flavodoxin and ferredoxin in the 2 Fragilariopsis species tested. Cultures of F. cylindrus grown at high iron concentration produced predominantly ferredoxin, with a small amount of flavodoxin. Ferredoxin was sequentially replaced by flavodoxin for cultures grown with less iron, although the response was not a simple switch from one protein to the other. The ability to produce ferredoxin is apparently absent in F. curta, with relatively constant levels of flavodoxin produced at all iron concentrations. These results strongly imply that the presence of flavodoxin alone cannot be used as evidence of ironlimited growth.